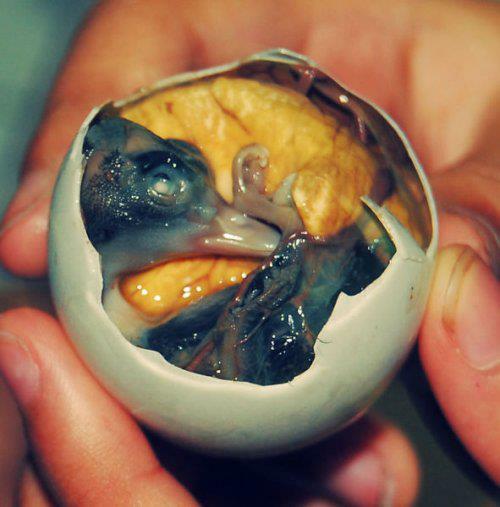 Balut are duck eggs that have been incubated until the fetus is all feathery and beaky, and then boiled alive. The bones give the eggs a uniquely crunchy texture.They are half-fertilized duck egg, served with a little salt after being boiled.It is commonly sold as streetfood in the Philippines. They are common, everyday food in countries in Southeast Asia, such as Laos, Cambodia and Vietnam.Balut is eaten in the shell. It’s often served with beer. In the Philippines, balut eaters prefer salt and/or a chili, garlic and vinegar (white or coconut sap) mixture to season their eggs.also In Philippines, balut have recently entered haute cuisine by being served as appetizers in restaurants, cooked adobo style, fried in omelettes or even used as filling in baked pastries. Previous article World’s Largest Omelette Of 110,000 Eggs.